+1 for awesome reference to awesome series! As you can see, Tristan is very unhappy with healthcare reform. Last edited by birdewilliams; 03-28-2010 at 04:56 PM. Yugi: ... Why did you just say that? Tristain: I HAVE NO IDEA! So...Tristain has an Egyptian spirit in him too? Yugi was a bit startled as he watched Honda try out his best impression of Yami Malik. Last edited by crack; 03-28-2010 at 10:54 AM. Reason: Errors in previous sentence. Last edited by TerribleMasterUrd; 03-28-2010 at 10:29 AM. This was Tristan's reaction when Yugi told him you can get almost every legendary Pokemon in Heart Gold and Soul Silver. As you can see, Tristan's is very unhappy with healthcare reform. Yugi: Oh Jesus. Tristan's learned how to breed, AND HE HAS BAKURA! It's Demon Eyes Tristan! We are all gonna die! Yugi: Whoops, Tristan got up too quickly again. Yugi: Oh no! It seems that with Tristan changing his voice too much, he hasn't been transporting enough oxygen to his brain and his blood vessels have burst! Trsitian has evolved into CountTristianula. Oh yeah, Mokuba's not the only Pokemon in Yu-Gi-Oh! Abridged. Last edited by Skoringo; 03-28-2010 at 10:51 AM. Tristan: Ahhhhh the chlorine water in the pool it BURNS!! As Yugi watched Tristan's transformation into some kind of snake-demon, he wondered why the animators had only given him a look of vague concern. Tristan: Wes needs the precious. Wes wants the precious. Gives me the ring-I means the Millenium Puzzle. Tristan: JACOB BLACK SHALL BE MINE! MINE I TELL YOU! 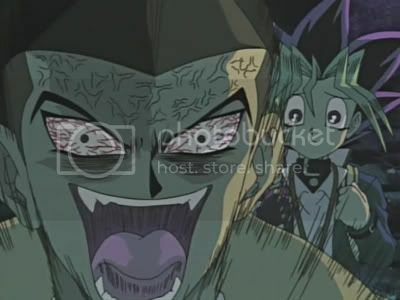 Yugi: I knew we should have never seen that movie. Tristan: I have been infused with the power of the Shadow Realm and I will use it to conquer this puny planet! Yugi: Don't you know that the Shadow Realm was just invented by 4kids in order to shield kids from the subject of death? "...and 5 episodes later Tristan finally ascended and gained Super Strength"
Yugi: You know, Joey loves his Red Eyes Black Dragon more than anything. Tristan: THEN I SHALL BECOME A RED EYES BLACK DRAGON!! Hence explaining the colour change of his eyes and skin, and the ever growing likeness to a dragon. Yugi: Why do you have such long hair coming out of your back? Tristan: FOR THE LAST TIME THEY ARE MOVEMENT LINES! Yugi: But we're standing still. The moment Yugi realised Tristan isn't really a nice person. This is the face i made when I beat God of War 3. Yugi: "Y'know what Tristan, if you're gonna do this everytime I put this song on... screw you, just... *facepalms*"
Last edited by JesusRocks; 03-28-2010 at 11:39 AM. 2: My mother f******g voices gives me motherf******g strentgh!!!!! 3: Chocolate...did you say chocolate!? CHOCOLATE!!!!!!!!!!!!!!!!!!!!!!!!!!!!!!!!!!!!!! 4: Tristen is a REAL vampire, F**** you TWILIGHT!!!!!!! WHY THE HELL IS KIRLLIN ALWAYS THE FIRST TO BE INDISPOSED OF! LOOK AT ALL MY FREAKING VEINS! Yugi "Okay, I officially regret my decision to let 4Kids cast us in this new demon- possesion movie. CUT!!! I'm outta here." Possesed-Tristan "You're not going anywhere, Yugi.... PREPARE TO DIIIIIEEEEEE!!!!!! Blurb: I'm not worthy of your kindness^^;;;!! Yugi: "Tristan? I think you had a few too many energy drinks...."
Tristan: "SPELL MY NAME RIGHT, DAMMIT!!!!!! !1"